In 2014, every Infiniti car will be renamed to start with “Q” — G37 will become Q50 — and every crossover/SUV will become “QX” — QX70 instead of FX50. Auto journalists have mostly condemned the move, saying Infiniti is sacrificing years of work building brand recognition for each model. But it’s actually a pretty good idea, because not only does Nissan’s luxury division lack model recall (how many people are M45-fanatics? ), but it’s had trouble building a unique image for itself as a whole. Some products are soft sedans targeting Lexus, others are sporty coupes with BMW in their gunsights, and of course their big SUVs target the likes of Mercedes, Cadillac, and Range Rover. 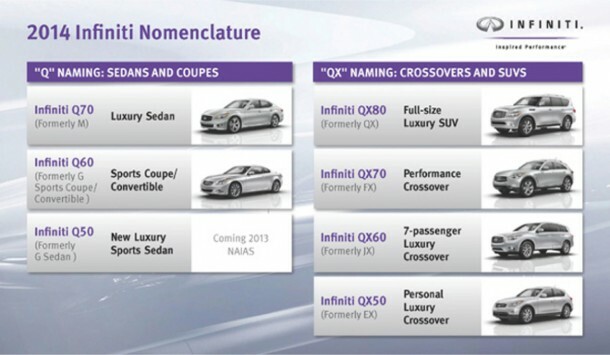 Now Infiniti will focus only on Audi, and the new names will shift the focus from “M45” or “EX37” to “Infiniti.” It’s no different from Audi, which calls every car “A” and every crossover “Q.” Stronger brands like Mercedes-Benz can afford to call their different models by different brand names (C, E, S, etc. ), with the subsequent number indicating engine size / variant, but for Infiniti, it’s probably more important to build the mother brand. Acura faced the same issue some years ago. They used to have names for their cars — who doesn’t remember the Integra or Legend — but those names completely overshadowed the brand, hence the Legend’s successor being named RL, for instance. Acura, though, has other problems to deal with— it still beats Audi and Infiniti in sales but has a muddled brand image and is losing its luxury edge on the product side (the ILX, for instance, is a barely disguised Civic). They also have an unclear naming system– the MDX and RDX are SUVs, but RLX and ILX are sedans, with the TL sitting between them. Sales-wise, Infiniti is already in the same range as Audi (about 100,000 per year in the U.S.), but Audi aspires to join the big leagues soon — Mercedes and BMW each sell roughly 200,000 per year in America — and has a more defined brand image than Infiniti. Life can never be certain for Japanese luxury brands in America these days– even Lexus is looking to revamp its brand image to appeal to younger crowds. Editorial: Tesla factory stores under fire – time to rethink how cars are sold in America? TechAutos © 2019. All Rights Reserved. Bad Behavior has blocked 631 access attempts in the last 7 days.